In one sense, Janna Vander Meulen is an accidental hurdler. Throughout high school in Puyallup, Washington, and into college at Western Oregon, soccer was her passion and focus. Racing over hurdles was fun, but just something that helped her stay in shape and hang out with friends. A decade later, Vander Meulen is an American record holder in the prime of a unique and inspiring athletic career. If things go as envisioned at the first World Deaf Indoor Athletics Championships that run March 14-17 in Tallinn, Estonia, the 28-year-old Portland woman will add a gold medal to her collection. Vander Meulen is one of 11 athletes, and one of three women, who will make up the USA Deaf Track and Field team in Estonia. Vander Meulen has won medals at two Deaflympics and at a world championship meet, including a gold medal in the 100-meter hurdles at the 2017 Deaflympics. At Estonia, Vander Muellen's focus is the 60-meter hurdles, where a win would also mean a world record since this is a first-time competition. To prepare, Vander Meulen attended a series of indoor meets at the University of Washington this winter, recording a personal best time of 8.99 at a meet in January that is 0.05 seconds off the American record for a deaf hurdler. Her hurdles coach is Fernando Fantroy, head track coach at Mt. Hood Community College, who has worked with Vander Meulen for five years. "She's been doing it for a long period of time and she's mentally dedicated to the craft and has a serious hard passion to get better," Fantroy says. Born with significant hearing loss — without hearing aids she can only hear very loud sounds such as fireworks — Vander Meulen was raised by her mother, Debi, in Enumclaw, Washington. She wears hearing aids and converses well by reading lips, but is in her element around other deaf athletes — which she first experienced as a member of the U.S. team at the 2012 World Deaf Athletics Outdoor Championships at Toronto. That she won gold medals in the 100 hurdles and the 400 hurdles at her international debut was a pleasant surprise, but the real highlight was interacting with fellow deaf athletes from around the world. Debi Vander Meulen says watching deaf athletes from around the world interact with one another is inspiring. "Being a part of deaf culture doesn't mean they stop being part of the hearing world. But it is so important for them to have equal peers," Debi says. "All their life they compete against hearing people, but this is a venue where they can compete against their peers and only their peers. "They're meeting people from around the world who are deaf, just like them. That's the amazing part." Debi suspected Janna had hearing loss within months of her daughter's birth, and it was confirmed around Janna's first birthday. Debi was determined her daughter would be active. Janna took ballet, tap dance, gymnastics and swimming lessons at a young age. When Janna was about 9, Debi signed her up for youth soccer. Janna remembers being scared about trying a team sport, and begging her mom not to make her go to the first practice. Mom insisted and Janna discovered her passion. "I loved it," Janna recalls. "It's nice that you don't have to talk as much, you just play, play, play, play. And communicate by hand signals which was perfect." Her love for soccer remains. She also played basketball and fastpitch softball growing up. She played soccer and ran track Rogers High in Puyallup, 25 miles west of her home, because the school had an American Sign Language program. 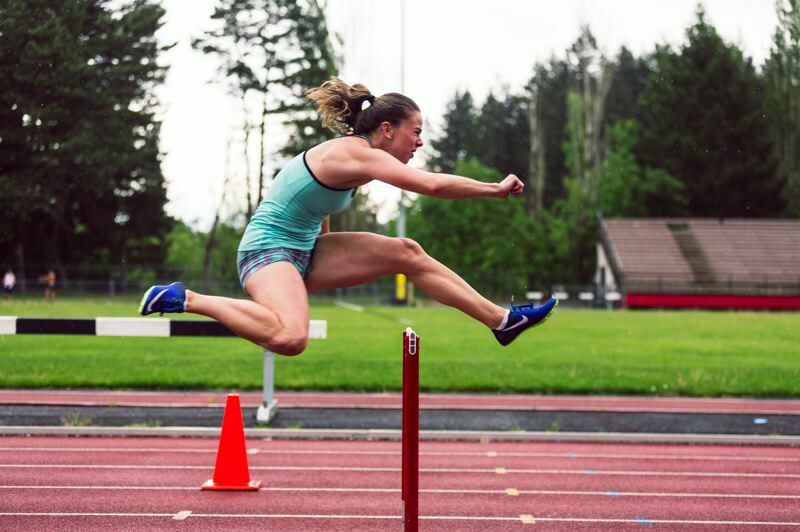 She first ran hurdles in junior high, intrigued after watching an older cousin at a meet. It was soccer that took her to Western Oregon. But after spending much of her freshman and sophomore seasons on the bench, Vander Meulen quit soccer and focused only on running track. "That was the hardest decision, but I didn't want a coach to turn me against soccer," she recalls. "It's funny, because during all of those years I played soccer, track was my least favorite. It was just something for me to do in preseason, something to keep me in shape." While at Western Oregon, she established college records for female deaf hurdlers in both the 100 hurdles and the 60 hurdles. These days Vander Meulen works her training schedule around a full-time job at the Nike Sport Research Lab, working with cameras to capture athletes in motion for the researchers. She trains at least twice a week with Fantroy, commuting from the Nike campus in Beaverton to Gresham for workouts. "He's been very helpful, especially with everything technical that I need to work on," Vander Meulen says. "It's funny because I thought I was in the best shape in college but I'm actually in better shape now." She does strength training with Harold Johnson at Athletic Advantage in Wood Village. In addition to improving her strength, working with Johnson has helped with recovery and muscle fatigue, Vander Meulen says. Fantroy calls Vander Meulen a "world class" athlete who is a positive influence on his college team. Thomas Withrow, head coach for USA Deaf Track and Field, says Vander Meulen is a leader for the team. "Janna is an exceptional athlete," Withrow said in an email. It is competitive fire that separates her, according to Withrow. At her first Deaflympics in 2013 at Sophia, Bulgaria, Janna lost the 100 hurdles gold medal in a photo finish to a Ukranian. Debi Vander Meulen, who has traveled to each of Janna's international competitions, recalls that it took 10 nervous minutes after that 2013 race for officials to declare the winner. Any disappointment in that result for Debi was overshadowed by the camaraderie she experienced at the Deaflympics. "Here's the thing I love about the other parents and athletes: When you're jumping up and down screaming, they're giving you a thumbs-up, even though they don't know you, they don't know Janna," Debi says. Prior to the 2013 Deaflympics, Vander Meulen was thinking about retiring from competition. Instead, that experience — which included a silver medal in the 4-by-100 relay and a bronze in the 400 hurdles — lit a fire for her. It was after the 2013 Deaflympics that Vander Meulen was introduced to Fantroy through a former Western Oregon teammate. "She knew how to hurdle, but her arms were all over the place, legs all over the place," Fantroy recalls. "It was step by step, working on her technique to make sure everything was going in the direction of the finish line rather than going to her left or right. Now everything is going in front." At her second Deaflympics, in 2017 at Samsun, Turkey, Vander Meulen finished in front of the same Ukranian woman for the 100 hurdles gold medal. Her time was 14.29 seconds, just missing the seconds off the world record for a deaf woman of 14.21. Fantroy says their partnership would not have survived for five years without Vander Meulen's drive to improve. 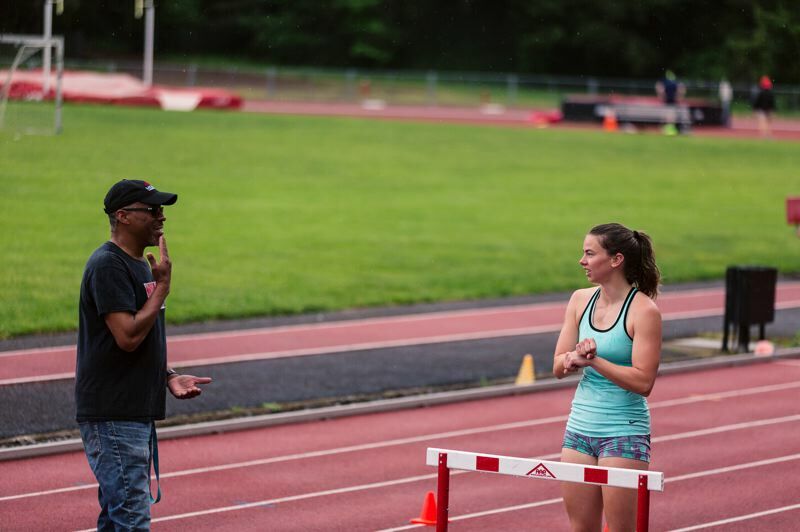 The one difference coaching a deaf athlete is that all communication must be face to face so she can read his lips. Another unique aspect is practicing starts with a runner who doesn't hear. At deaf competition, a lights system is used to start races. Fantroy sometimes uses a flashlight, but says Vander Meulen has learned to react instantly to motion from runners next to her on the starting line. In the short 60-meter race, the start is obviously important. So is acceleration. Vander Meulen says she feels like she is just reaching peak speed when she hits the finish line at 60 meters. In preparation for the world indoor championships, improving speed between the five hurdles has been a focus, according to Fantroy. A little improvement there and Fantroy can see Vander Meulen setting the American record for deaf hurdlers in Estonia. He predicts she also will run a sub 14-second 100-meter hurdles outdoors this year. "She's at her prime age. Working 40 hours a week and then committing 20-30 hours a week to training shows how motivated she is," Fantroy says. "It's a lot. But she's mature enough to handle all that." The demands are more than time. USA Deaf Track and Field, while affiliated with USA Track and Field, is responsible for funding international itself. To compete in Estonia, Vander Meulen and her teammates each had to pay $1,250 for travel, lodging and food. "Money is always a problem," she says, noting with a laugh that some athletes, such as those from Russia, are paid significant reward money if they medal at the Deaflympics. Vander Meulen has raised the money for this trip. She uses social media to spread the word and posts training videos online to show prospective supporters that she's for real. In addition to chasing gold medals, Vander Meulen also is motivated to show fellow members of the deaf community that they can pursue big things. "It's a problem in our deaf community where after high school it's 50-50, you either go downhill or you go uphill," she says. "It's really scary how many people decide to go downhill and just stop and not try anymore" because they don't see any opportunities beyond high school. Track and field has taken Vander Meulen farther than she dreamed possible. Beyond Estonia, Vander Meulen is looking forward to the 2021 Deaflympics. (A site has not yet been finalized for those Games, a situation Vander Meulen says is not unusual given the planning and investment required to stage the competition). Fantroy says Vander Meulen can continue to get faster. "She's been doing it for a long period of time, and she's mentally dedicated to the craft and has a serious hard passion to get better," he says. "She can go at least to 33 and still be competitive in her division."